Fusion Chunky - Fancy Cotton & Linen Boucle in pebble and shingle shades. Crochet, dyeing, weaving, knitting crafts. 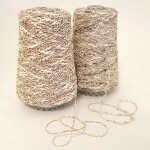 Fusion Chunky is a range of undyed yarns spun from natural coloured linen with undyed creamy cotton twisted through. 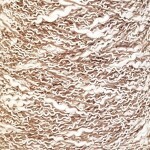 These yarns have bags of character, so great for adding texture to a variety of projects. A great starting point for these yarns is to use them as they are due to the interesting colour combinations found in the natural cotton and linen, but they will be great to dye with cold water or natural dyes for unusual effects. Perfect for weaving and tapestry weaving to add strands of interest, though advised to be in the weft only as they have some stretch and not a huge amount of strength. 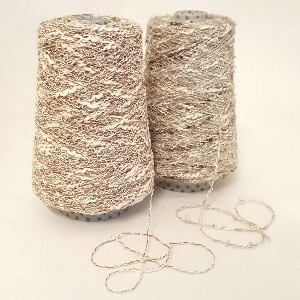 These are great yarns for couching into embroideries or trapping into handmade paper or felt where landscapes, walls, sheep or any kind of natural texture is required. Also make excellent rustic looking skirts on tassels. It’s difficult to gauge an accurate ply with these types of heavily textured yarns, but should be around a heavy 4ply to a DK thereby perfect for knitting or crochet projects – keep it simple and let the yarn do the talking! May be suitable for standard gauge knitting machines, though the thicker slubs could be tricky, so opt for a chunky machine if you struggle. Suitable Crafts: Braidmaking, Crocheting, Dyeing, Embroidery, Feltmaking, Knitting, Papermaking, Silk Papermaking, Tapestry Weaving, Tasselmaking, Weaving. A most unusual yarn, but in fairly short supply, so buy now as it won’t be repeated.